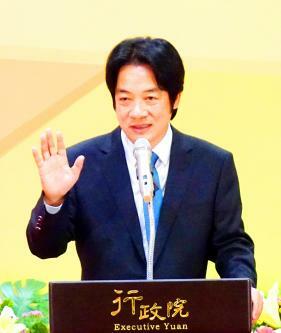 Premier William Lai presides over a ceremony on Friday in Taipei to honor this year’s outstanding civil servants. The eight major policies are: making all official government Web sites bilingual, making official documents used by foreigners bilingual, providing bilingual frontline services in public settings, making the government’s public data available in English, making laws and regulations that pertain to foreigners bilingual, promoting bilingual services in cultural and educational settings, training civil servants to conduct business in English, and making professional and technical licensure exams available in English. An online English database should be created within three months, and within a year, laws and regulations related to education should be amended, the council said. Within a year, more than 50 percent of official documents and licensure exams used by foreigners should be made available in English, 60 percent of frontline public services should be available in English, and 70 percent of the laws and regulations that pertain to foreigners should be available in English, it added. 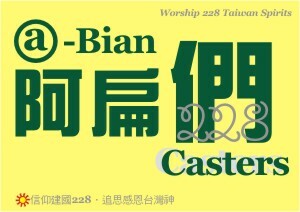 Lai in September instructed the council to spearhead a plan to make Taiwan a bilingual nation by 2030, in response to globalization, and to improve the nation’s proficiency and competitiveness in English. While previous policies have focused on national English proficiency exams, the council’s plan seeks to raise the nation’s overall competitiveness, sources quoted Lai as saying yesterday, adding that the policy aims to motivate the entire nation to learn English. The council is expected to present the plan to the Executive Yuan tomorrow. Laws must be amended to establish a flexible and innovative way in which students can learn English, the council said, adding that regulations in the Primary and Junior High School Act (國民教育法), the Senior High School Education Act (高級中等教育法) and the Private School Act (私立學校法) might need to be relaxed. Lai said that education is the most important task in the plan, and he has instructed the Ministry of Education to propose draft amendments to the regulations within three months. The council’s plan suggests incorporating digital technology, such as livestreaming, artificial intelligence, augmented reality and other resources to create opportunities for personalized learning accessible to everyone. The plan’s goals include having English classes at elementary and junior-high schools taught only in English and pushing for some subjects in elementary and junior-high schools, and all skill-based courses at vocational high schools, to be taught in English. While the council would oversee the plan, it would be an effort across departments. The deputy directors of participating government agencies would form a committee to promote bilingualism and execute the strategies. Local governments would implement the plan based on the unique characteristics of their city or county. As a trade-oriented economy, Taiwan can use English as an important means for connecting with the international community, Yuanta-Polaris Research Institute (元大寶華綜經院) president Liang Kuo-yuan (梁國源) said. 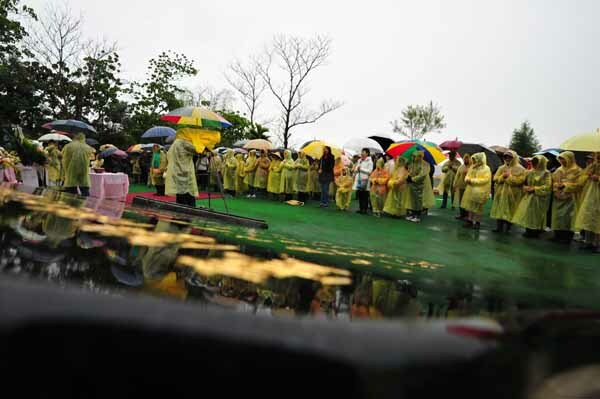 Tears, memories, pictures, butter lamps, written messages and a video clip, friends of the Dalai Lama’s 45-year-old nephew Jigme Norbu — who was killed in a traffic accident during his latest “Walk for Tibet” campaign in Florida on Monday — gathered in Taipei to remember him. “I learned about the news that Jigme Norbu was launching a ‘Walk for Tibet’ in Taiwan on Dec. 9 [last year]. I signed up to join him on the walk and departed the next morning,” said Huang Shu-chiao (黃淑嬌), who accompanied Jigme all the way on his 407km walk from Taipei to Kaohsiung over 13 days.